Cadillac is so weird with their trims which engine omits which trims. I’ll have to figure out Cadillac’s goofy optioning schematics another time, but I think the CT6 is “supposed” to be around $8,000 more than a directly comparable CTS. By the way, the CT6 3.0T Platinum starts at $88,460. There is pretty much a $20,000 gap between the Luxury-Premium and Platinum trims on the 3.6L and 3.0T equipped CT6s. The Platinum trim is literally just a discount for buying a fully loaded model. 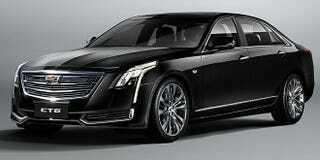 Here is my theory though, the CT6 is the new CTS LWB! Due to both the S-class and 7-series going LWB as standard in the US, this means LWB mid-sizers will replace the short wheelbase version of luxury flagships in North America. How often do you see XJLs and A8Ls in the US? I would say there’s a 3:5 (60%) take rate where I live at least. Why not make the LWB standard and push your top sedan further upmarket and turn what used to be a base model into a top end, prestigious option on your midsizer? Nothing but wins, especially since midsize luxury sedans are the least remembered in the lineups (for me at least). I tend to forget A6, GS, 5-series, and E-class because there is a high performance compact in the same price range, or a higher badged just above them. A4, _, A8 and IS, _, LS in my mind. Unless I’m looking used, then I always remember the middle children. Seems like Caddy will be a BMW/Jag contender in driving dynamics when it comes to the sedans while the SUVs will go for Audi and Volvo instead of BMW and Porsche. I think that is a solid strategy. If Cadillac does decide to go after the Macan, F-Pace, X5, and Cayenne then those models will be separated and called the XT4 (Compact Sports CUV) and the XT6 (Midsize 2-row CUV). Luckily Cadillac’s design language does allow for X6/GLE “coupe” silliness.